Vollet.in is a digital Wallet for smartphones that helps consumers get connected to merchants through through loyalty program. It helps consumers to easily carry and use their loyalty membership, providing all information about the program, promotions, store location, all at their fingertips. 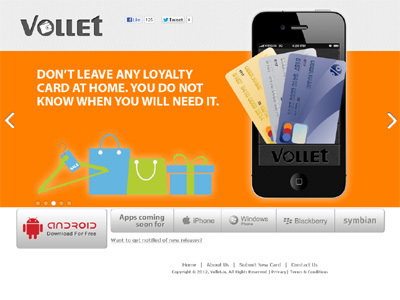 Vollet will help the consumers to see the required loyalty and promotions, deals, offers related information all at one place on their mobile phones. This will help consumers to benefit most from the promotions they receive via multiple traditional channels like newspaper, email, online portals, etc. For merchants its a two way channel to help build, grow and track their loyal customer base. Merchants can communicate to their loyal customers who are using Vollet and can send highly personalized promotions to them. The detailed analytics helps them to rightly build their campaigns. For merchants with no loyalty program in place, they can use Vollet’s cloud based loyalty program and start building loyal customer base. Vollet is all about local and loyal customers. Vollet is the first such product for Indian consumers who would like to get connected to their favorite merchants and start taking maximum benefits of their loyalties. For merchants, its a new communication channel to build, grow and track loyal customers via Vollet’s SAAS based platform.